I thought I Finished Infamous: Second Son. Turns out there's plenty left. 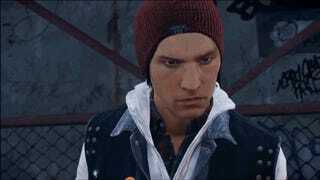 Infamous: Second Son came out on Friday. If you picked up before the weekend, it might be the case that you've blown through the main storyline already, soaked up all those tasty powers and are purging the Department of Unified Protection out of Seattle. Seems like all that Conduit drama's all done, right? No more superpeople to chase down, no more mysteries to suss out. Wrong. There's another metahuman that Delsin Rowe needs to reckon with. And the way her story's being presented is one of the coolest things about Second Son. WARNING: Mild spoilers follow for parts of Infamous: Second Son and the Paper Trail missions. The missions that follow are fairly typical Second Son sidequests: fight a group of enemies, investigate an area, follow a person/thing. But it's how they link up to a series of fake internet destinations that mark an interesting divergence from the rest of the game. Paper Trail exists somewhere in the notional space between a companion app and an ARG; it's a trail of breadcrumbs that basically has you going from playing a few sequences in the game to piecing together clues, which in some cases appear on various fake websites. Some of these sites get linked on the Paper Trail profile pages and tie into Second Son's fiction in obvious ways: a research center specializing in the science of Conduitism or an advocacy group preaching the message that Conduits are people, too. When the pop-up investigative view wouldn't launch for the dog and Aloha pictures in Chrome, I tried it in Safari, chalking it up to a quirk of the browser or code. I wasn't expecting different images altogether. Maybe it's just a speed bump. But it could be intentional. You never know with these brain-teaser/ARG-styled experiences. I'm only two chapters into Paper Trail, but I'm already appreciating how deep this rabbit hole seems to be. One of the puzzles already stumped me for a good long while. It's also turning what would otherwise be a less-exciting post-campaign piece of time into an intriguing investigation of an experiment. It's meatier than the little flyer in the Second Son game case would have you believe. On one hand, it's not new at all. In fact, it's kind of retro. But Paper Trail gives this new Infamous game a flavor I didn't I'd be sampling. So, whether you've finished the story or not, don't ignore this one; it could take you places that surprise you.